Have you ever started a task accidentally that you wanted to cancel? Unfortunately there isn’t an easy way to stop characters in the middle of their tasks, unless of course you decide to remove them from your town temporarily. By putting a building into storage you can reset all ongoing tasks in that building. If a building has a character attached to it, the character associated with that building will also be put back in storage, like in the example below. This trick is useful for canceling tasks, as well as finding characters. If you put the building in storage and then immediately rebuild it, the character associated with that building will appear right outside of it. It’s a good plan if you just can’t track down the character you are looking for in your town. Use this option with caution though, storing buildings will reset the timer on the income they passively generate. TSTOgame has been live for just about a month. What do you think of the site so far? Is there anything you would like to see change? Is there anything you would like to see added to the site? How did you first find this site in the first place, and has it earned a place among your bookmarks? I want to find ways to boost traffic, as well keep people who already know about this blog coming back daily to see what’s new. Any thoughts, ideas, comments, or suggestions? All feedback is welcome. 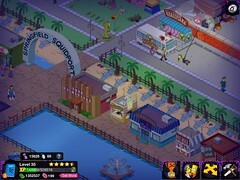 I’d like to make this the only site you need to check when it comes to staying informed on The Simpsons: Tapped Out.